In this review we explain why you should be very careful when dealing with Crypto Dukes of Jaden Monahan. Crypto Dukes is supposed to be a private club for the world’s best Bitcoin traders. It was founded by Jaden Monahan and it is promoted on the CryptoManiaNews website. If you become a member of the club, you will allegedly be able to learn profitable strategies for crypto trading and make money. We see several problems with CryptoDukes. These are the reasons why you should not trust it. 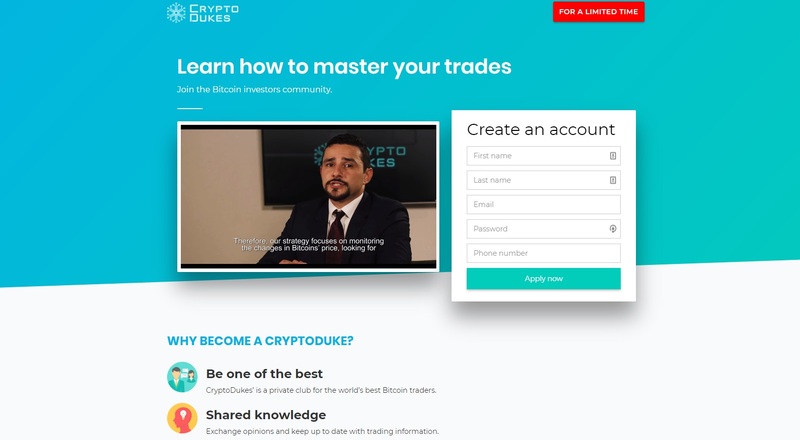 CryptoDukes obviously providing trading strategies that are supposed to make you money, in other words they are teaching people how to trade. This is the definition of investment advice. Jaden Monahan is allegedly based in Australia and we know that Australia regulates investment advice, you have to have a license to be able to legally teach other people how to trade. So where is Menah’s licence? We don’t see any, so we believe that Crypto Dukes is an illegal service. On the Crypto Dukes website we found one testimonial. A man is claiming that there are real experts in the club who made him discover the true potential of cryptocurrencies. But the review is fake, because the photo has been stolen from somebody who does not even know about CryptoDukes. See our picture and the proof. This is where Crypto Dukes will send you. 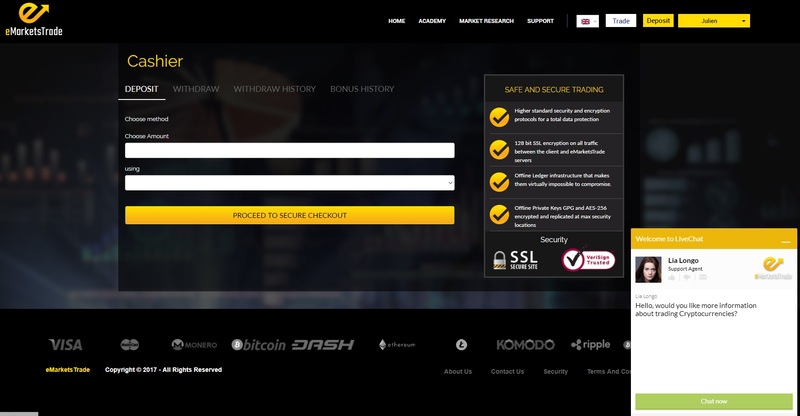 We registered for Crypto Dukes to see what the real package is, but surprise, no information, no strategies, we were immediately redirected to deposit page of an unregulated broker – eMarketsTrade. Although Crypto Dukes said we would get a demo, we found no demo, we were pushed to deposit at least $250. And this is not serious. Only scammers push you to deposit this way, they give you nothing, they just want you to send money somewhere. At this point it was obvious that the primary aim of Crypto Dukes is to earn affiliate commissions with unregulated brokers (you will also see Zuercher Capital in the video). In other words Menah is getting paid for referring new depositors to affiliated brokers. Crypto Dukes shows a fake testimonial and is pushing you to deposit with an unlicensed broker, so we believe that it is a scam that you should avoid. If you are interested in cryptocurrency trading, try a free demo with a regulated broker. Don’t trade with real money unless you are sure that you know what you are doing and acknowledge all the risks. I am not sure what cryto jukes is but i have traded with emarkets for around 5 months with no issues apart from the fact that they wouldn’t accept my old paper drivers licence as a form of id. When i spoke to my account manager he said that sometimes affiliates are doing whatever they can to get commissions and that they are constantly working with different affiliates and that this affiliate had been reported. Granted that i am certainly not no millionaire but i made a nice amount trading ripple! I also traded Riplle with them and made 4 X my investment. They were extremely helpful in the process. However try cashing out and the tables turned. Abusive calls during day and night time, threats of only paying my original investment should I decide to cash out (which btw is a decision I am allowed to make!). To this day I am waiting for over one month for any money from them. When enquiring about the payout you just get delayed and delayed some more. PLEASE BE AWARE OF THESE COWBOYS!